More than 160 students at Peachtree Charter Middle School put their science, technology, engineering and mathematics (STEM) skills on display by building sturdy, inhabitable works of art. 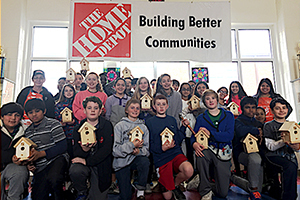 Peachtree Charter partnered with their local Home Depot to provide enough lumber and tools to build 160 birdhouses. Students in Molly Newton’s seventh-grade art classes joined students in Alethea Crowder’s eighth-grade science classes to measure, shape and craft the wooden houses, measuring transfers of energy and amounts of force along the way. Newton said the project empowered students by showing them they can create something from almost nothing. Crowder said students really enjoyed participating in a hands-on engineering exercise. Crowder and Newton plan to split the birdhouses 50/50 for a decorative project and an upcoming charity art show. The mural, according to Newton, will help shelter local birds and also add to Peachtree Charter’s ever-evolving beautification. The art show will add a feature of student hand-painted birdhouses—a bonus project for participating students. Peachtree Charter STEM coordinator Tim Ryan said forging partnerships with local businesses is a key component in making STEM learning successful at DeKalb County School District. Ryan said the activity included not just STEM-centered students, but students at all levels of the school’s curriculum. He said an important component of understanding STEM is realizing it extends beyond working at NASA and the like. According to Ryan, many students aren’t exposed to hands-on activities with a finished product that students can hold in their hands. Josefina Hernandez, a representative from Home Depot who helped coordinate the birdhouse build, is a Peachtree Charter alum. “I loved coming to Peachtree Charter for middle school and I was super excited to help advance STEM exposure to my alma mater,” Hernandez said. 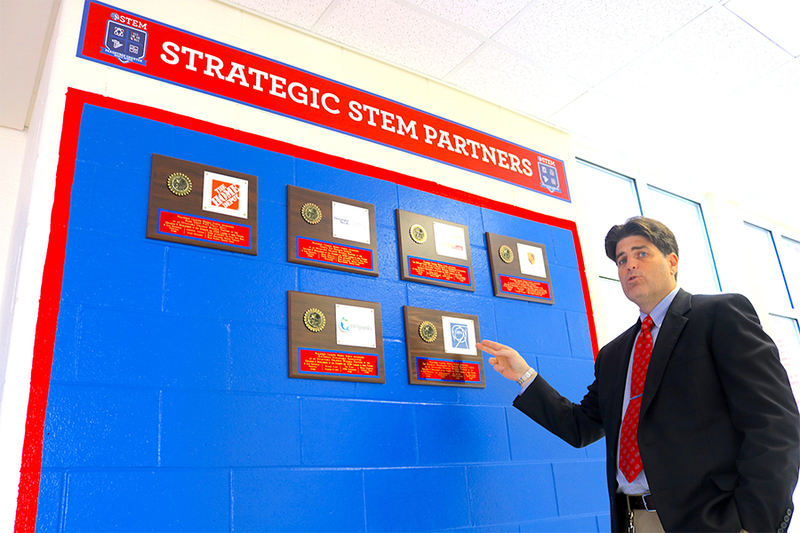 The school’s local Home Depot, located along Tilly Mill Road in Dunwoody, joins Porsche, CERN, Georgia Tech, the DeKalb County Board of Health, and HATPonics Sustainable Agriculture as a strategic partner in promoting STEM learning. Ryan said students at Peachtree Charter Middle can look forward to more activities involving each partner every school year. On March 2, Porsche will partner with Peachtree Charter for a downhill race at Brook Run Park.